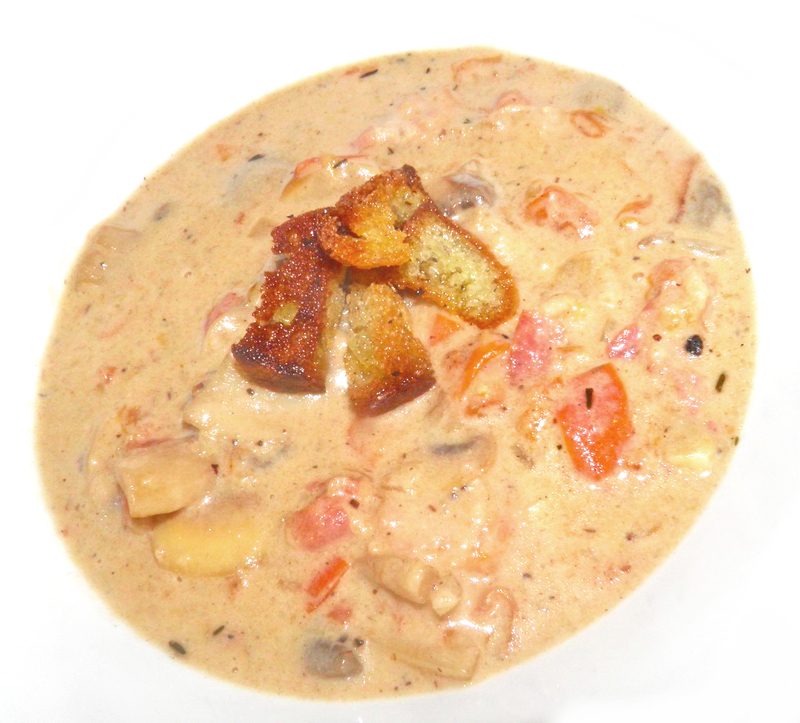 Mushrooms, tomatoes, bacon, cream...and beer. Beer on the side too, of you wish! Interesting weather we're having lately. Last week started in a deep freeze, and now we're above 0°C even over night. Great weather for colds and flu, or at least being susceptible to them. And today it's rain. On occasions like this there’s nothing that hits the spot quite like soup. This soup will lift your spirits regardless of the weather. It’s basically a cream of mushroom, but with additions. This soup got my “tingle of approval. “ I think I’ve mentioned that phenomenon before. I have this strange thing that happens whenever I first taste something that my taste buds bleieve is really good. It’s kind of like a cross between a shiver and the hair standing up on your neck. It’s the “tingle.” I don’t get it often, and when I do it means a lot. pot, but they reduce a great deal when fried. This recipe started off as an ordinary enough mushroom soup. What came out of the pot was something quite different. It’s amazing what happens when you just keep adding things... within reason. The first addition was lots of bacon. I wanted this soup to be filling so meat was in order. I’ve often rendered fat from a couple slices of bacon for cream of mushroom soup. 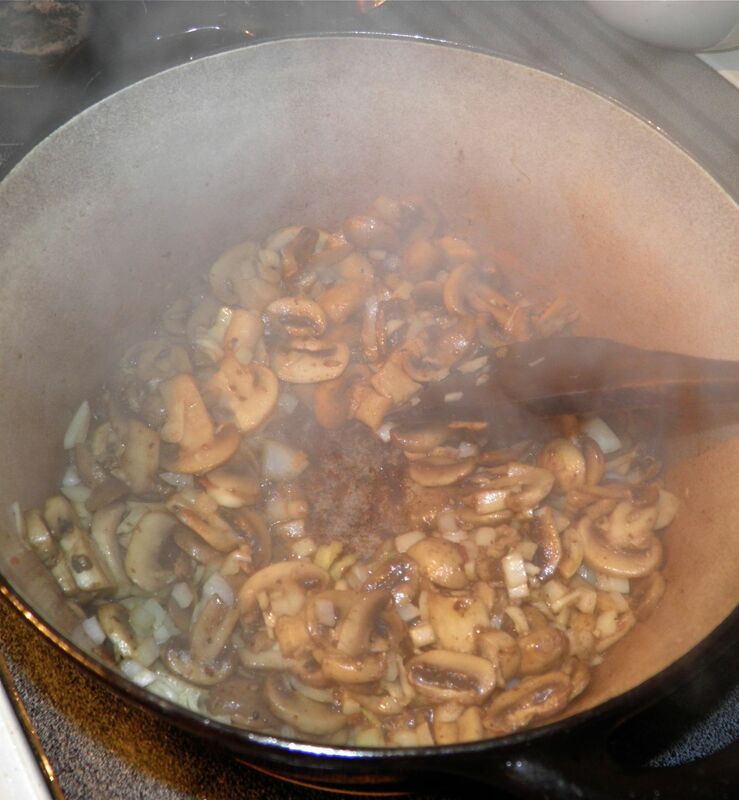 It gives you something to fry the mushrooms in, plus some flavour complexity. I also had a couple tomatoes on the counter. Had to use them. Where I really took a chance was with the beer. I was a little apprehensive when it went in, but all worry evaporated (with a little of the alcohol content) when it all came together. In fact, if you didn’t know it, you would never guess this soup had a whole bottle of beer in it. Mushrooms and beer seem to be made for each other. Another less than usual step was thickening the soup with grated bread. A few days ago I had made ciabatta rolls. One was left over. It was just enough to use for that purpose, and make some croutons. Thickening with bread is a medieval technique. In fact there were many recipes for “bread sauces,” many of which used cream and spices mid with the stale crumbs. It was an economical way to use up leftover bread. I will be using this technique again. It’s not only resourceful, but adds an excellent body to soup, which often can be unsubstantial. This time I used a beer by Rickard's® called Oakhouse. It's not too bad. Next time I think I go "whole hog" and use a Guinness! All in all, this soup turned out better than good. Not too bad for a basic cream of mushroom soup that seemed to take on a life of its own. 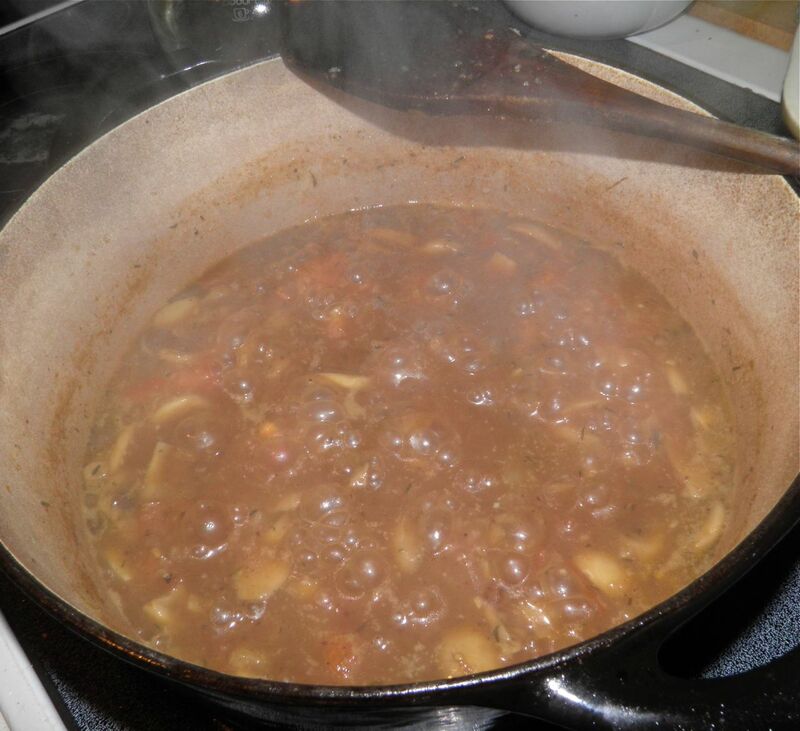 If you try this soup, I can almost guarantee that you’ll find it in your pot more than once! melds all the flavours together. Slice the mushrooms in four pieces. Add to the fat and cook for about 3 minutes. Then add the onion and garlic and sauté until the mushrooms begin to brown. Add the chopped tomato, beer and broth. Stir well and bring to a simmer. Then stir in the grated bread. The soup should thicken up instantly. Stir in the thyme, pepper and salt and let cook for about 20 minutes, until the tomatoes have completely broken down. Stir in the evaporated milk and bring the soup back to steaming. Taste for salt and pepper and adjust if desired. Serve with croutons pan fried with olive oil, and grated cheese if you wish.